If you haven’t guessed or noticed, I love all new baby products. I love checking them out, testing them and seeing what all has been improved or developed. 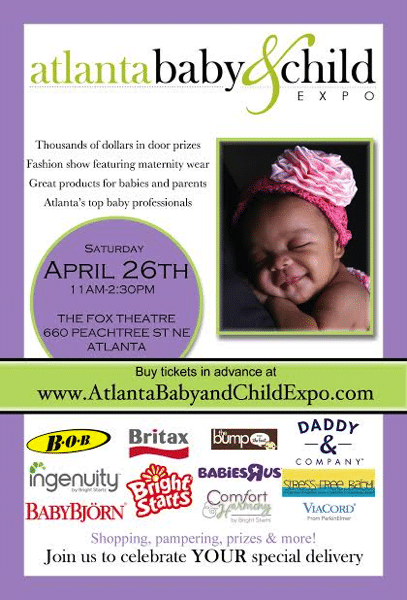 The best place to check them out in my area is the The Atlanta Baby and Child Expo. It is considered THE premier event for expecting and new parents in the Southeast. They bring in the ultimate in parenting and baby products and professionals. I went two years ago when E was tiny and was able to see so many new and exciting products. There were and will be local brands and stores as well as some of the bigger brands you know and love. It’s an elite experience, intimate in setting and not overwhelming. It’s a party for everybody; expectants, new parents, grandparents and their family and friends. The Atlanta Baby and Child Expo features a Maternity Fashion Show, Red Carpet Photos of attendees as you enter, awesome baby gear to buy and try, thousands of dollars in giveaways and so much more! Head over to the The Atlanta Baby and Child Expo website and purchase your tickets. Or, you can enter to win a pair of tickets here. Me a n one of my friends will attend the event with our toddlers. I would attend with my mother! Really hoping to get to go to this! Me ! I want to go oh so bad! I’d bring my friend with me!